-Improve student learning outcomes using Connect our easy-to-use homework and learning management solution that embeds learning science and award-winning adaptive tools to improve student results. 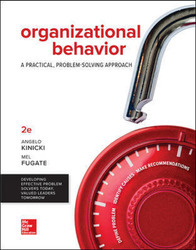 -Help students’ develop the skills of problem-solving that are highly desired by employers using a consistent, 3-step problem-solving approach. –Engage students in practical and relevant application of theory with student-centered features: OB in Action Boxes, Applying OB Boxes, Problem Solving Application cases—all based on real-world sources.